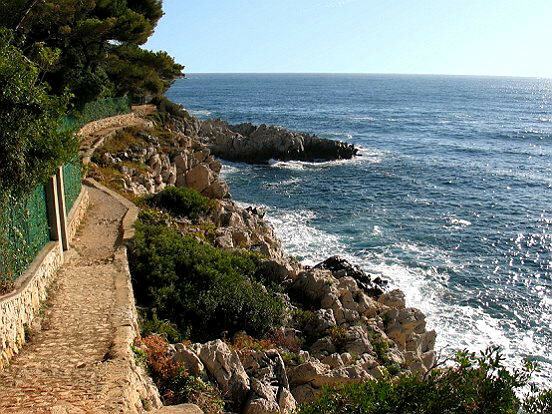 Running on the Saint-Jean-Cap-Ferrat coastal trail is one of the most spectacular runs in southern France. This run has it all: water, views, history, a bit of elevation, and few cars. Saint-Jean-Cap-Ferrat, is a peninsula 10 km east of Nice. It is a favorite holiday destination, and one of the more exclusive areas of the Côte d’Azur, with its yachts gracing the port, and high-end restaurants and shops. 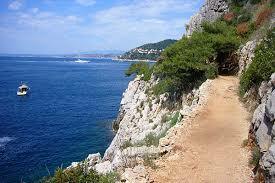 There’s a gorgeous coastal trail that goes down to Cap Ferrat and most of the way around the peninsula. a distance of some 6.5 km. On the eastern side, it is called Chemin de la Carrière, and on the western side it is Chemin des Douaniers. There are water views much of the way, with spectacular homes (often blocked by hedges or fences) on the inside. The width of the trail varies and is a bit narrow in spots. The surface also varies — some sections are gravel, others a bit rocky, and occasionally a bit sandy. But very runnable. There is some altitude gain on this route. The part of the route in town takes you along the seaside promenade and port, with wonderful restaurants, and yacht-viewing. Can start in the center of town - Tourist Office, port.